You may be aware of some of the applications of cannabis and cannabinoids in treating a long list of diseases. Today we focus on its therapeutic potential to prevent and treat bone injuries or diseases, an area of medical application where research conducted over the last few years has yielded very promising results. If you usually follow the blogs on medicinal cannabis, you are certainly up-to- date on many of the therapeutic applications and medicinal benefits of cannabis in the treatment of numerous diseases such as multiple sclerosis, cancer, AIDS, pain, glaucoma, epilepsy, and a long list of others. On this occasion, we are going to focus on another area of medical application: the treatment of bone injuries and diseases, where research conducted in the last few years has yielded very promising results. The use of cannabinoids from the cannabis plant, including cannabidiol or CBD, has demonstrated the therapeutic potential of these compounds in helping to prevent and treat injuries or diseases. Moreover, they contribute to a faster recovery from bone fractures and can even make them stronger than they were before. However, what they undoubtedly know with certainty is that the endocannabinoid system plays an important role in keeping our bones healthy by, among other things, facilitating a process known as bone metabolism or bone remodeling. Throughout our lives, our bones undergo daily wear and tear, which bone metabolism deals with by replacing mature bone tissues with new ones, keeping bones healthy and strong. Every year, an adult’s body replaces around 10% of its bone structure. In addition to daily wear and tear and bone loss from ageing, we may experience other types of bone disorders – such as bone fractures or fissures caused by injuries or accidents – or bone diseases, which are both common and painful, including osteoarthritis and osteoporosis. We are going to review some of the most salient and interesting scientific research conducted over the last few years, to help us understand how cannabis could aid in preventing and treating bone injuries and diseases. 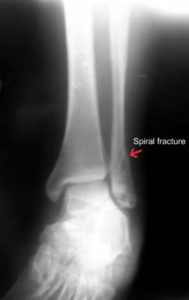 The way in which our body responds to a bone fracture is very similar to its response to soft-tissue injuries, at least in the initial phase. When a bone in our body is fractured, there is a disconnection between the two ends of the fractured bone. During the second phase of fracture treatment, fibrocartilage callus forms, which is the bone’s first regenerative response and is the first bridge between the bone ends of the broken bone, as the initial step towards linking them. In the third phase, the hard or bone callus forms, which gives stability to the fracture. During the fourth phase, also known as the remodelling phase, the bone returns to its natural form. One of the most recent studies, which was conducted in 2015 by the University of Tel Aviv and the Hebrew University, has shown that cannabidiol or CBD, one of the non-psychoactive phytocannabinoids of cannabis, can aid fractured bones to recover more rapidly. The study, which was given a lot of press coverage both within and beyond the sector, was published in May 2015. The study involved the use of rats, which is usual when testing most medicines, such as for osteoporosis, before conducting clinical trials. The University of Tel Aviv research team used two groups of rats, which both underwent the same femoral fracture. One of the groups was injected with a CBD mixture, whereas the other group of rats was administered a combination of CBD and THC, the main psychoactive compound of cannabis. The results were surprising. What the scientists discovered eight weeks later was that the rats which were given only a CBD injection not only experienced a more rapid recovery, but their fractured bone also regenerated to such an extent that they were even strengthened. However, in the group of rats that had received a combination of CBD and THC, there was no effect with regard to the speed of the body’s recovery process. As we have already pointed out, the endocannabinoid system plays a key role in bone metabolism by protecting bones and fighting bone diseases. In another study published in the British Journal of Pharmacology in 2011, it was discovered that fatty acid amides (FAAs) help to coordinate the bone metabolism process through their interaction with cannabinoid receptors. In the skeleton, FAAs activate the cannabinoid receptor CB1 present in the sympathetic nerve endings, as well as the cannabinoid receptor CB2. Fatty acid amides play a key role because they are disrupted by a specific enzyme called fatty acid amide hydrolase (FAAH), which is inhibited by CBD’s action. In other words, CBD prevents this enzyme from disrupting the compounds that aid bone formation. According to the study’s authors, “the inhibition of FAAH (thanks to the action of CBD), the enzyme which degrades FAAs, can be a useful therapeutic strategy to fight osteoporosis and perhaps other skeletal disorders.” This is why they insist more studies are needed which focus on the complete profile of these lipids and their receptors in bone tissue in order to shed light on their role and mechanism of action. Our bones are an essential part of the anatomy of the human body’s skeletal system. Whereas some of these bones are hard and compact, others are light and porous. The bones and cartilage (that is to say, the fibrous connective tissue) constitute the body’s hard internal frame. In order to keep our bones healthy, it is important for it to have sufficient minerals, such as calcium and phosphorous, and a protein called collagen. Therefore, deficiency in these minerals or collagen can result in bone diseases. Moreover, bone disorders can have a genetic cause and while some people are born with a bone disease caused by defective genes or inborn errors of the metabolism, others can develop degenerative bone diseases later in life. 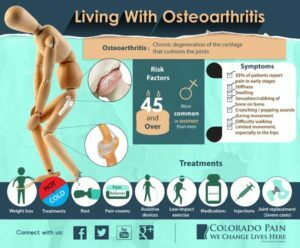 All these diseases, such as osteoporosis or osteoarthritis, which cause patients a lot of inflammation and pain, result in a weakening of bones, which can lead to fractures – with hip fractures amongst the most frequent. 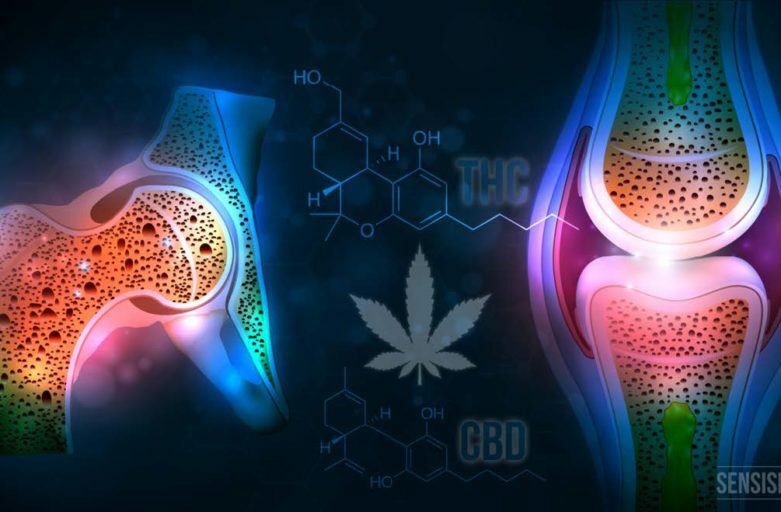 The studies conducted over the last few years confirm that cannabinoids can be powerful therapeutic agents too and offer protection against these bone diseases, which are so painful and debilitating. Osteoporosis is a progressive disease that causes bones to become thin and porous, due to either ageing or lack of adequate nutrients. It is characterized by “a reduction of osteoblast matrix formation together with an increase in osteoclast bone resorption and by the resulting marked reduction of the total amount of bone in the skeleton (osteopenia, which means “bone poverty”).” That is to say, the loss of bone mass occurs faster than is considered normal with the passage of time. Women are more commonly affected, especially those over 60 years of age. Besides exploring the possible treatments with CBD, as the current study recommends, there are other cannabinoids which could also turn out to be powerful and preventive therapeutic agents. Cannabigerol (CBG) is another phytocannabinoid that cannabis contains. 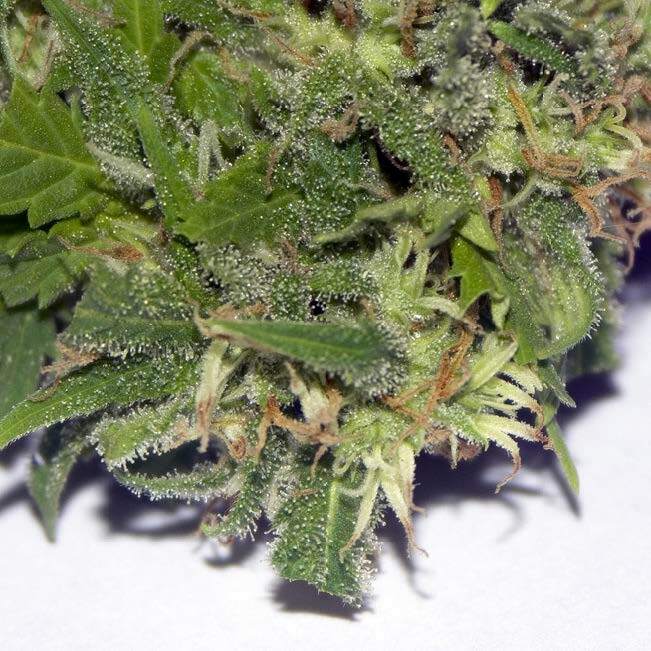 It is without psychoactive properties and is currently being studied for its potential bone treatment properties. In fact, GW Pharmaceuticals, the famous company that has its headquarters in the United Kingdom, has a patent for the therapeutic use of a drug containing CBG as possible treatment for osteoporosis, among many other diseases. And let us not forget THC, the most well-known cannabinoid and psychoactive compound of cannabis, which can also have something to contribute in the prevention of bone fragility. THC binds to cannabinoid receptors that are in specific sites of our bodies. CB1 receptors are also found within bones. The CB1 receptor is one of the 2 primary cell receptors in our bodies to which THC binds and influences the biochemical processes in these areas. In a study published in 2009 and conducted by the University of Edinburgh’s Rheumatic Diseases Unit, it was confirmed that the CB1 cannabinoid receptor protects against the development of age-related osteoporosis. According to the study, which used mice as the test subjects, the mice which lacked CB1 receptors developed denser bones, although they continued to suffer from osteoporosis. When examining the bone density in these mice, it was found that there were fatty deposits inside their bones, which should have been filled with bone marrow. The investigators argue that in addition to regulating the amount of mature bone tissue that is broken down and reused in the body, the CB1 receptor controls the amount of fat that is accumulated inside the bone, along with the formation of new bone cells. Another study was also conducted by the Hebrew University of Jerusalem and published in 2009, which analysed the role of cannabinoids in reversing bone loss. The study confirmed that there is a relationship between CB2 receptors and bone density in mice with mutated CB2 receptors; they had a lower bone density than mice without mutated CB2 receptors. According to the scientists’ statement, it seems that the physiological involvement of the CB2 receptors is associated with maintaining equilibrium in bone remodelling, thus protecting the skeleton from age- related bone loss. Indeed, the study also discovered that alterations to the CNR2 gene, responsible for coding CB2 receptors, can cause postmenopausal osteoporosis in humans. All these results, as well as those of many other studies, show that the endocannabinoid system presents a promising therapeutic objective for the treatment of bone diseases, especially age-related ones, such as osteoporosis. 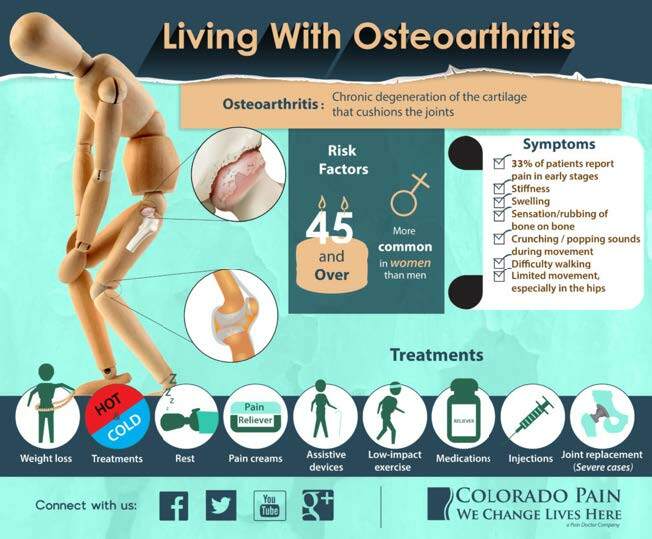 Osteoarthritis is the commonest type of chronic rheumatic disease worldwide. 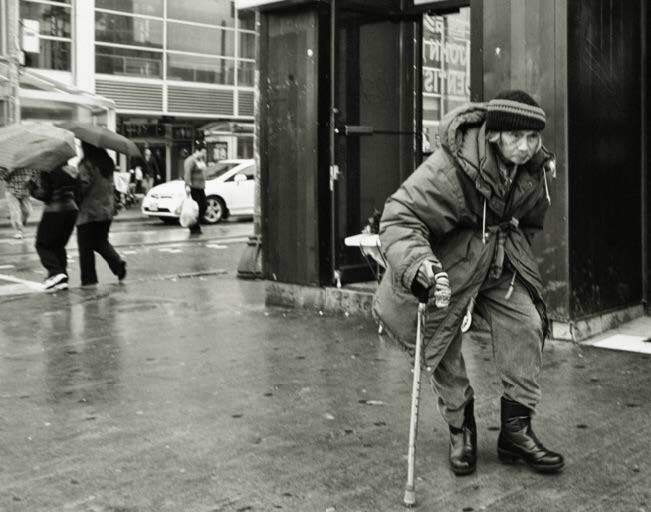 It affects a large portion of the population as it ages, influenced by factors such as obesity, genetic inheritance, previous injuries in joints, etc. It is a chronic and degenerative disease, which progresses by wearing down the cartilage, the tissue which cushions and protects the ends of the bones, as well as facilitates the movement of joints. When the surface of the cartilage is broken and worn away – which occurs gradually and progressively – the most common symptoms are pain and stiffness in the affected joints of the body. Although osteoarthritis can affect any joint, it most commonly affects the small joints of the hands and the base of the big toe (“bunion”). 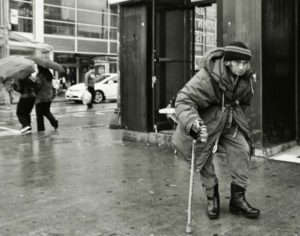 In a study published in 2000, a research team at the Kennedy Institute of Rheumatology in London tested the effects of CBD on osteoarthritis in mice. The mice were injected with forms of collagen with induced osteoarthritis in order to imitate the symptoms of human osteoarthritis in the bodies of the laboratory animals. When these symptoms started to appear, the mice were orally administered a CBD-based treatment, which literally stopped the progression of osteoarthritis in the mice. In 2010, another interesting piece of research was conducted and published by the University of Dublin, which analysed how cannabinoids can aid in tissue engineering, in this case applied to cartilage. 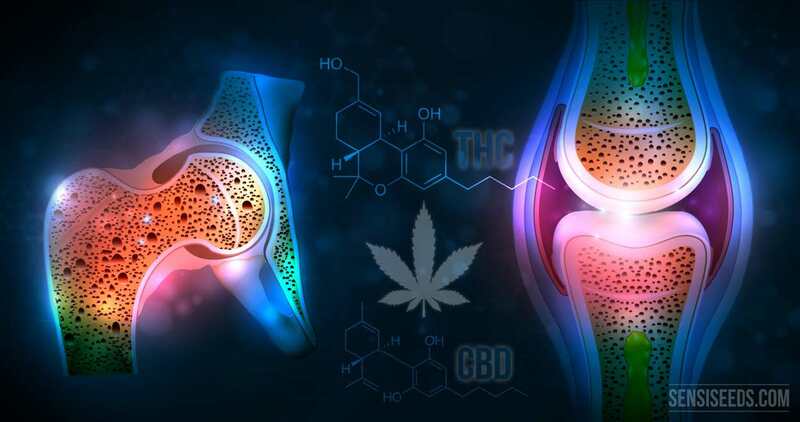 The study suggests that cannabinoids prolong the life of the mesenchymal stem cells, or MSC, which can be used to create new cartilage, thereby making it a crucial option for future treatments of osteoarthritis. Also in 2016, a team of Chinese scientists published their findings on human cartilage and cannabinoids. The study is the first known attempt to treat sample cartilage containing proteins associated with osteoarthritis with the synthetic cannabinoid WIN-55 in vitro. 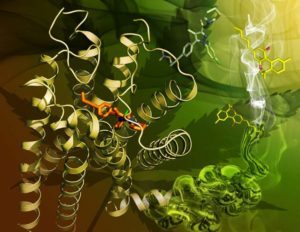 Through the action of this synthetic cannabinoid, a new mechanism was discovered by means of which the cannabinoids can help prevent the wearing down of cartilage by deactivating the enzymatic proteins associated with osteoarthritis, thereby halting the progression of the disease. objective and a very interesting biomarker for this disease. Nevertheless, there is still a lot of work to be done in order to accurately determine the efficacy and safety of cannabinoids (of phytocannabinoids and synthetic ones) in the treatment of rheumatic diseases such as steoarthritis. This is why it is so important to continue researching the role that the endocannabinoid system plays in the physiological and pathological processes of our bodies. Although there is still a lot of work that needs to be done to develop suitable therapies – both for bone injuries and diseases and in a wide range of diseases and disorders – the clinical potential of cannabinoids is undeniable. It is important to carry on with research work in order to be able to continue with this line of study in clinical tests in humans, which many believe would be the next natural step. Nevertheless, as this article tries to show, we already have a lot of evidence that shows that cannabis compounds can aid in preventing bone fragility and in keeping bones healthy. Throughout the article, we provided links to some of the most recent scientific research that provide such evidence. speak for themselves and seem undeniable. ← What’s the difference between CBD oil and full spectrum cannabis oil?